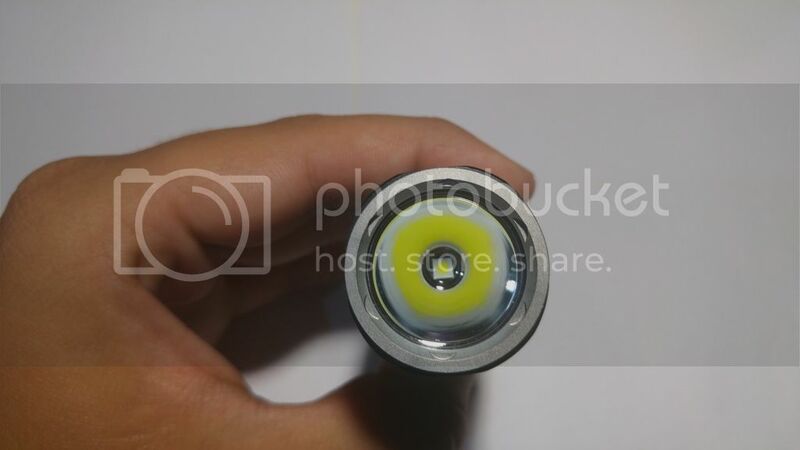 Battery comes inside the flashlight , with a little plastic disc on the negative side of the battery . 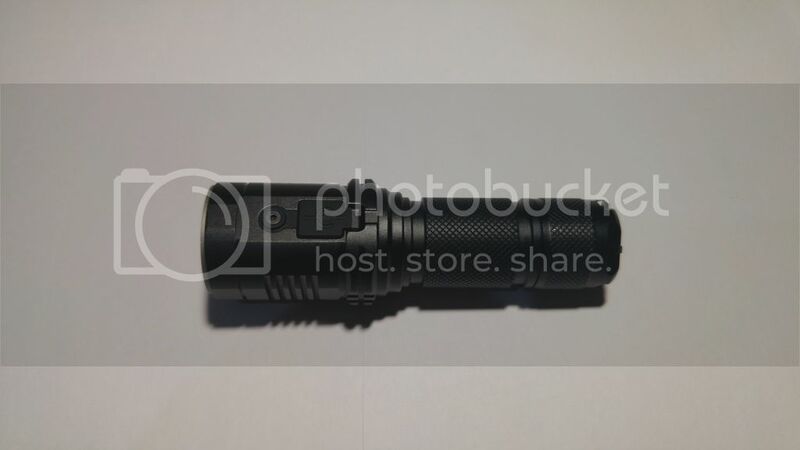 You need to remove it in order to operate the flashlight . You can see it uses an LCD display and 2 touch buttons ! You will notice DN11 is a little longer . 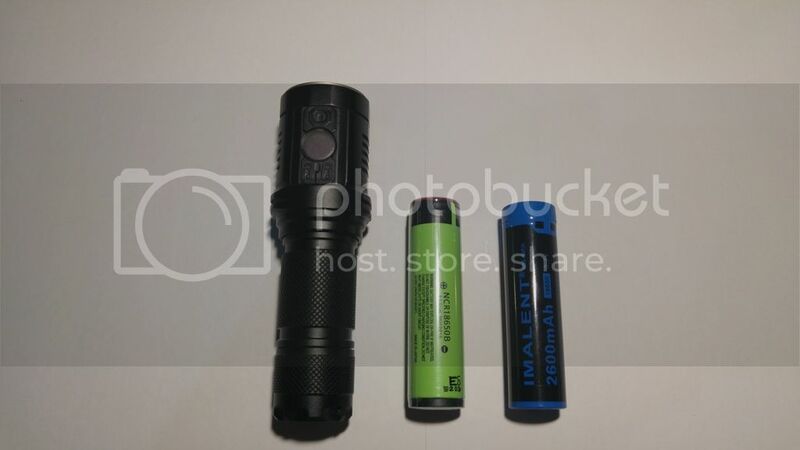 - When flashlight is on (on highest setting) , on the 4.5 minute mark , it steps down at about 650 lumens . That happens if the flashlight reaches the temperature of 55oC . As you can see , it reduces with little steps as the time passes , without any big drop . Measurements ended at 124 minutes , with flashlight producing moonlight-level light , while the battery was at 2.87 Volts . -Built-in charger charges batteries up to 4.19 Volt in my unit . 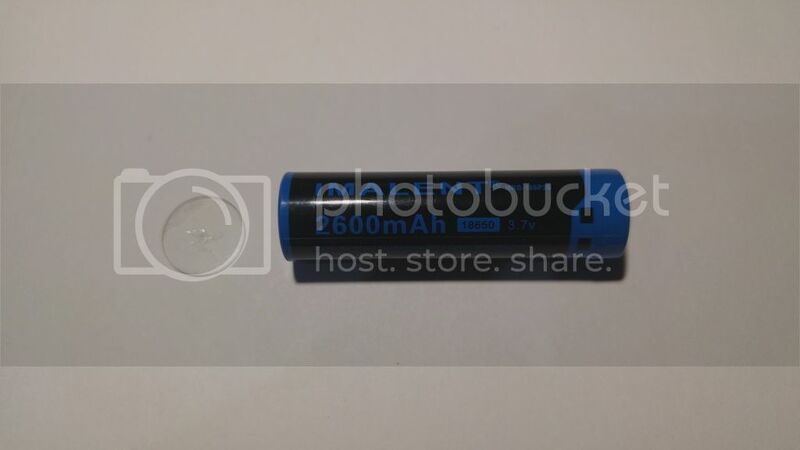 -Battery that comes with the package is a true 2.650mAh battery. Overall it’s a very interesting light , with some brand new features like the Lcd (in such a small light) and the touch buttons . Touch buttons are a little difficult to use until you find the right way to do it . For sure it needs some improvements. Lcd is a very nice feature , and i found it really useful. The quality and anodization is great , not a single issue in my unit . I like the beam , quite throwy , but with a usable spill. Please comment if you want me to test something else . You are free (and i would like to) to tell me your opinion about tje review . 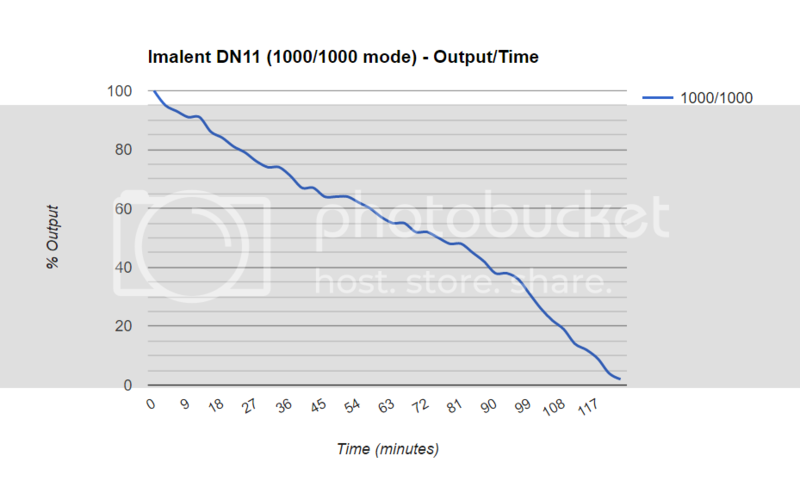 21/8 – Updated Performance/Runtime with “1000/1000 level” Output/Runtime graph . Probably today when i get home i will do the “1000/1000 mode” Performance/Runtime measurements . I will have to use a fan , so i can see real efficiency (without the temperature warning changing the output) . Edit : Review updated (see post #2 for update log) . Any suggestion for other brightness level to review ? If you can figure out what lock and unlock do you will be my favorite person ever. Al i can see they do is turn the display off and on with a gnetle swipe. The LED display. Shows lumens and voltage. Fairly accurate. This is an awesome feature that I wish more lights had. It’s not perfect though. The display isn’t that sharp owing to Imalent’s use of frosted clear plastic over the display. Smooth plastic or glass would have worked better. Nice fairly throwy beam. Not surprising from the relatively large smooth reflector and XPL HI. The beam pattern is quite nice. Overall very good build quality. 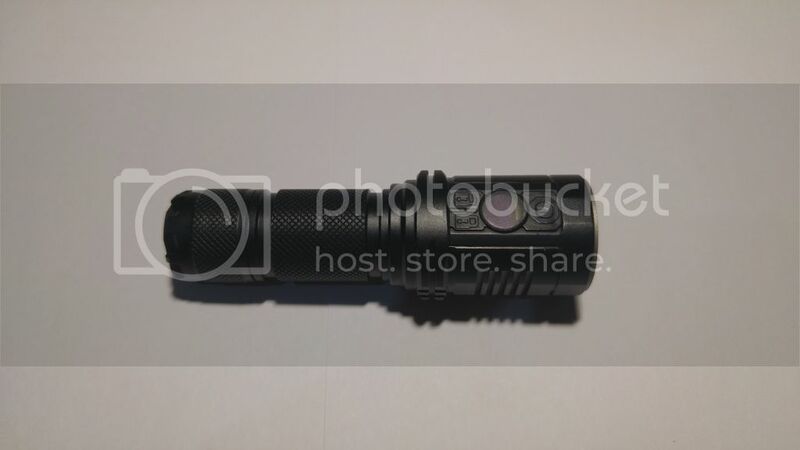 Price: much cheaper than a Zebralight SC600w III HI. Innovative. 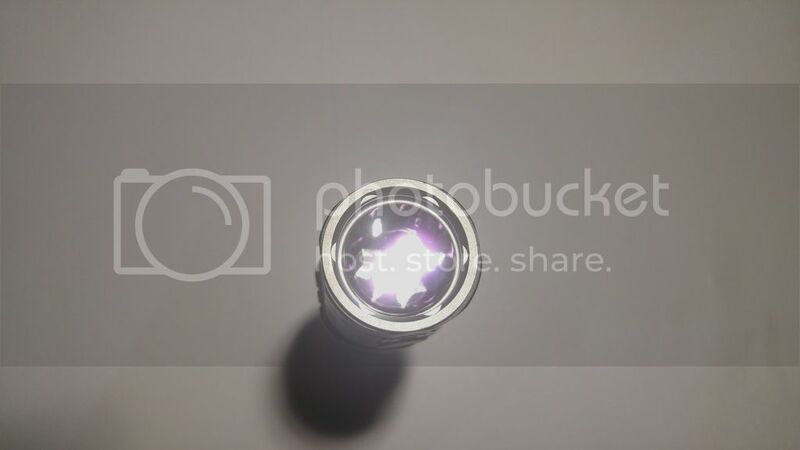 It’s rare to see flashlight developers trying something new. The LED display on this light is quite innovative and something other manufacturers aren’t including. The “touch” sensors are unreliable. Sometimes it takes me 3 or 4 tries just to get the light to turn on. The touch sensors feel like a gimmick. Why couldn’t they just have used a couple momentary e-switch pushbuttons like other lights? Momentary switches would have worked 10x better. It feels like Imalent tried to reinvent the wheel and forgot to ask themselves “Is this actually better?” I consider these finicky unreliable controls the biggest negative of this light. The “touch” sensors are hard to find by feel. Expect to have to rotate the light a few times before you locate the controls. And this is before having to spend multiple tries just to get them to work. Bad UI: The light only has one mode, with 2-way ramping and memory. Unlike a magnetic control ring, the ramping is far too slow to serve as the only control. This light really needs shortcuts to min and max. Defective shipment. My package failed to include the micro-USB cord that was supposed to ship with the light. Poor placement of micro-USB jack. 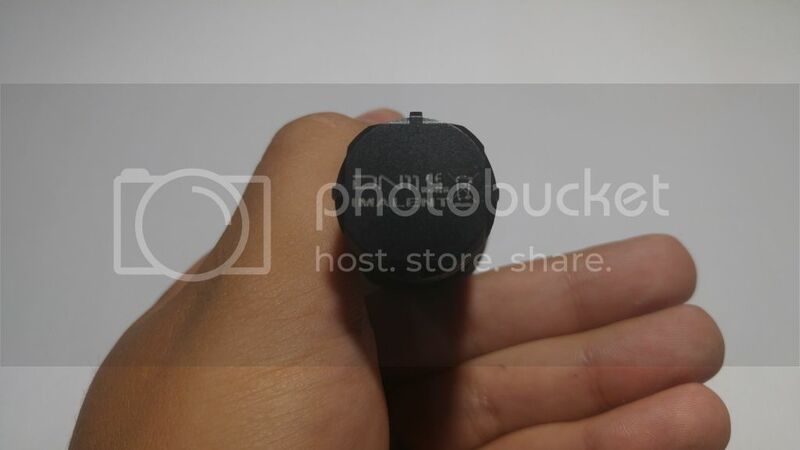 The micro-USB jack is too close to the bottom edge of its recessed pocket for the rubber cover. 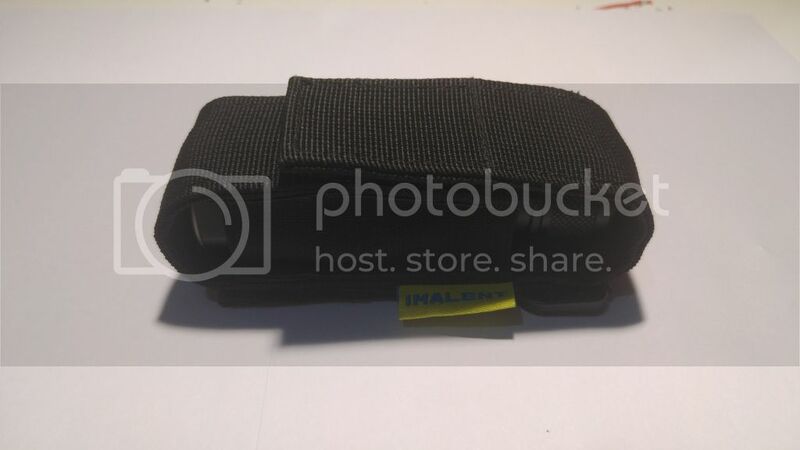 Many standard micro-USB cables won’t fit because of this. 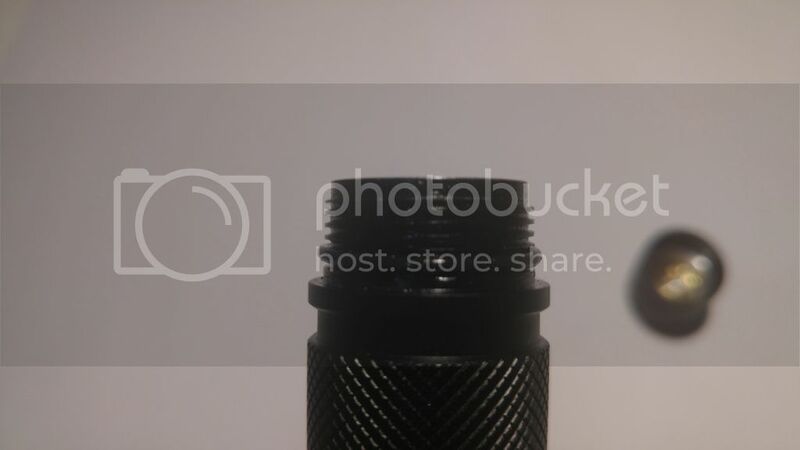 Imalent should have centered the socket under the rubber cover, or made the socket and cover bigger. Cool white tint. I prefer neutral tints. I have not attempted to replace the emitter with one of better tint as I decided it was not worth the effort. Chunky. 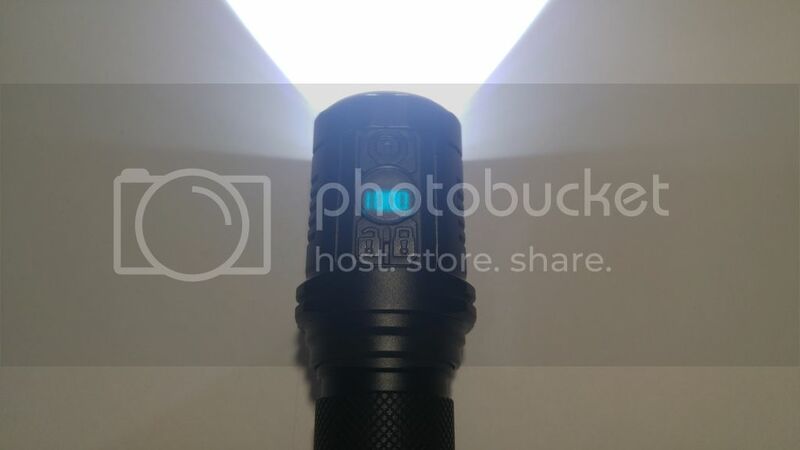 For a single 18650 light, this light is chunkier than I’m used to. I find this light too big and heavy for pocket EDC. While it might make a good searchlight, I can’t really think of any situation where I’d grab this over my SC600w III HI. I will agree Firelight. 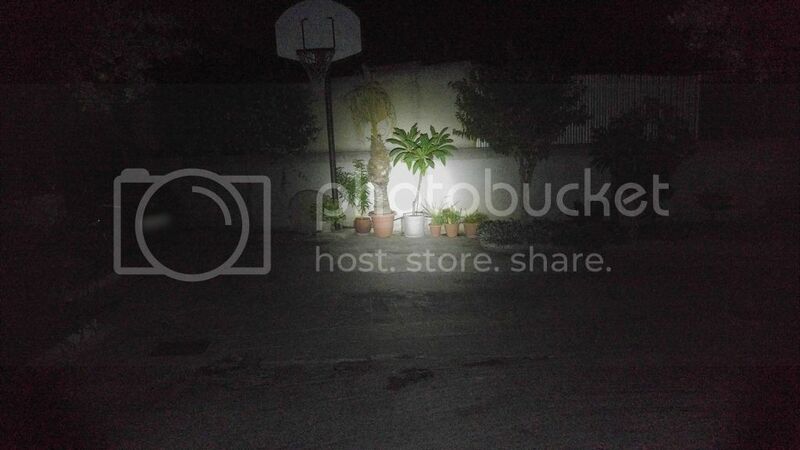 Also when its completely dark , it’s even more difficult to locate the switch and power the flashlight. Nice work. Well done Γιώργη. Nice review. 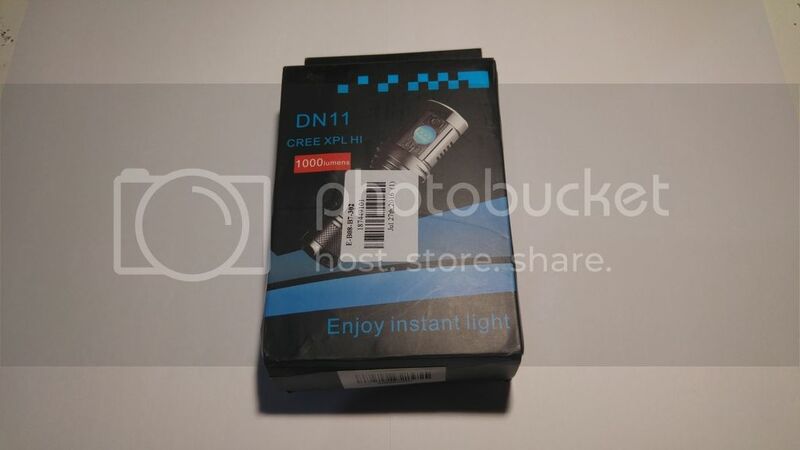 I’ve just received mine today, and after playing a bit with it, I reckon the DN11 is not too bad. Except for the padlocks. Weird icons for the screen on/off function. A single tap turns the display on and off! Thanks for your kind words people . Tony i expected more from the “lock-unlock” button . For example , disable the touch buttons until you press it again , or something like that . 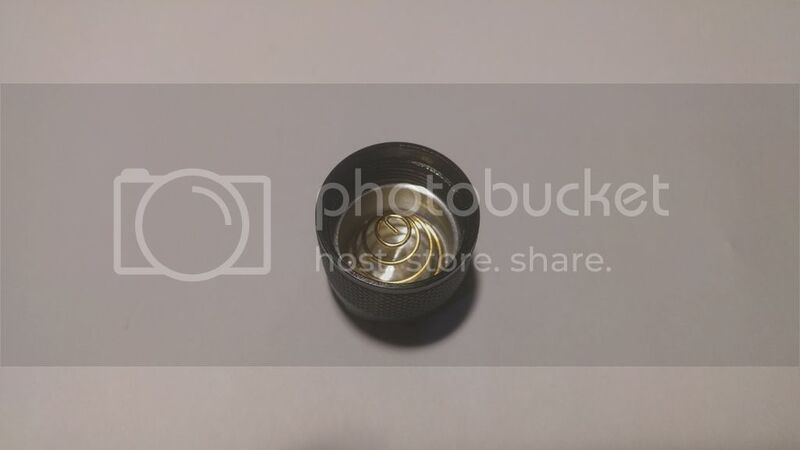 Thank you for the review and the pics! I’ve got one in Astrolux guise and my feelings are mixed. Mainly due to the touch button operation. The buttons are hard to find in darkness and the response is very inconsistent. Having said that. It’s a great Mk I version. Improve the haptic side of the buttons and the consistency of the response and it’ll be an unbeatable proposition in single 18650. I would suggest a clicky on-off button (tail but shrouded so it can be used standing up) and a further look into the electronics. I’d also like to see over- and undercharge protection built in for the Mk II version . Would be nice to enhance it and make a BLF version of this one. Potentially, it’s a winner. It is for sure , the first of its kind , and we expect more from Imalent . Not visible with naked eye . I think it has a pretty high frequency (i have noticed low frequencies before with naked eye , like jetbeam) . I commented on this light before and after trying to use it for some time, I agree with OP. It’s not bad (display) but it could have been so much better. When Manker picks up the idea of the Oled but with a proper switch in, let’s say, a U11 format and choice in tints of LED, I would jump. I’d loved to like this light but in it’s present form, I don’t. But I still think this is the way to go. UI should be programmable once, then fire and forget. It should have a less throwy reflector option, haptic switch and firefly mode. I’d still like a child of this and the Manker U11, which I consider the all-round best single 18650 light. A friend of mine started a “gite” (small site with several holiday homes) in France. She needs an all round, fairly small, rechargeable, but luminous light. 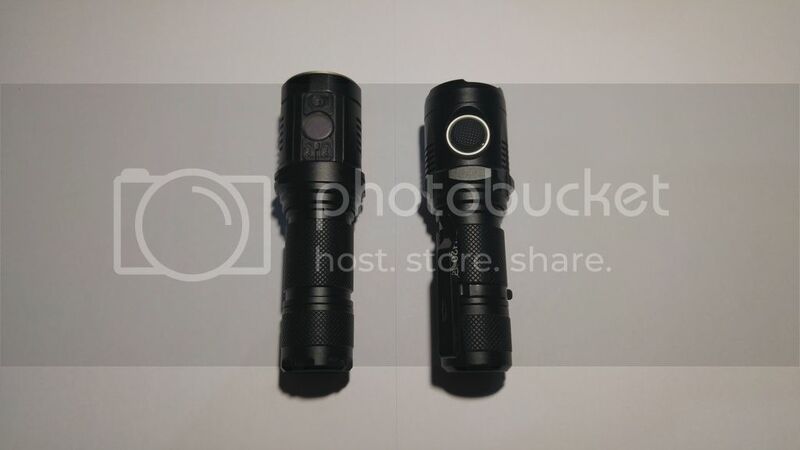 I recommended the Manker U11. I wish I could have recommended this one. 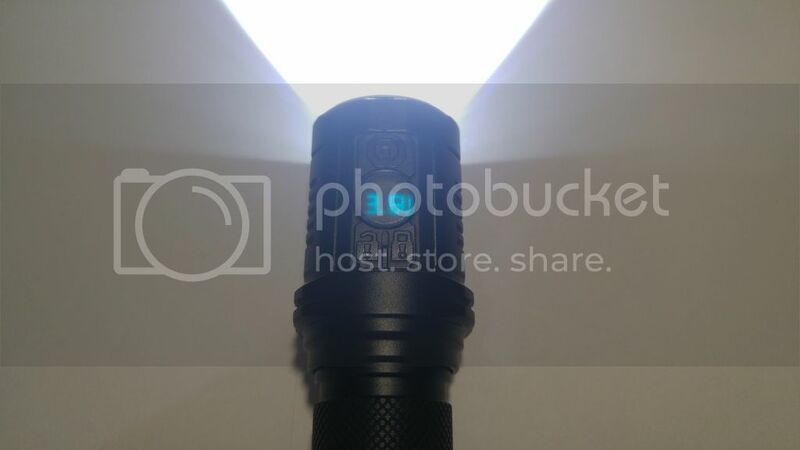 First time I’ve read about an Imalent flashlight, seems very interesting. 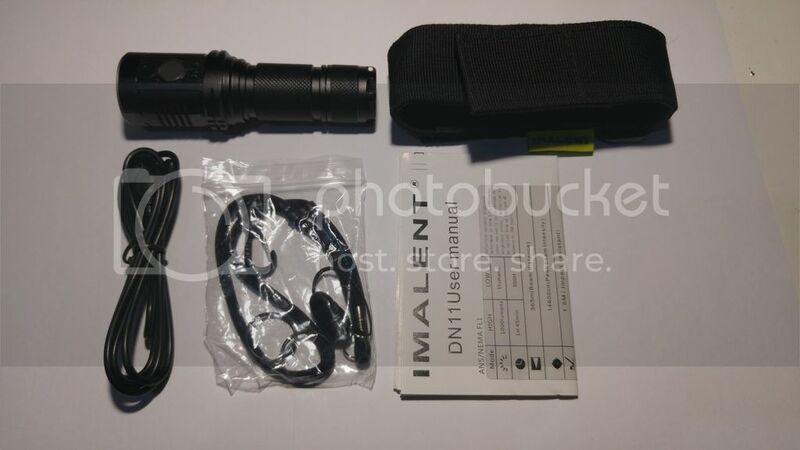 First time I’ve read about an Imalent flashlight, seems very interesting. Thanks for the review.